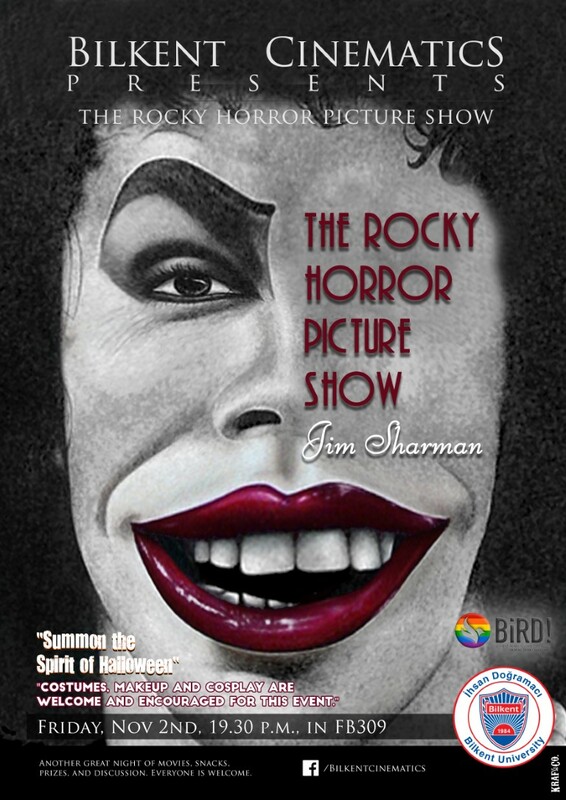 This week Bilkent Cinematics, and Department of Communication and Design, are teaming up in the screening of Jim Sharman’s 1975 cult classic, ‘The Rocky Horror Picture Show’, on Friday, November 2, at 7:30 p.m in FB309. Based on the 1973 musical stage production ‘The Rocky Horror Show’, the film centers on the newly engaged couple Brad Majors and Janet Weiss who find themselves lost with a flat tire on a gloomy November evening, somewhere near Denton, Texas. Seeking a telephone, the couple discovers the eerie mansion of Dr. Frank-N-Furter, a transvestite scientist, where they meet a group of strange and outlandish people, including servants Riff Raff, his sister Magenta, a groupie named Columbia. What ensues is something straight out of the books of science-fiction and horror, but funnier. In 2005, this cult classic was selected for preservation in the United States National Film Registry by the Library of Congress as being “culturally, historically, or aesthetically significant”. Offbeat and bizarre, the BBC critics’ view is that: “for those willing to experiment with something a little bit different, a little bit outré, The Rocky Horror Picture Show has a lot to offer”. The movie will be introduced by Bilkent Cinematics as always and Think Colorfully for this special event. ‘The Rocky Horror Picture Show’ screens on Friday, November 2, at 7:30 p.m, in FB309.Everyone is welcome to attend Cinematics film screenings. All movies are shown in their original language with English subtitles, and snacks and beverages are always served. Bilkent Cinematics aims to bring film lovers together and create a community through film screenings and entertaining, informative post-screening discussions. Each semester we host several film screenings, all by great directors, which we hope provide more insight and understanding into the themes of these influential films. In doing this we want to promote the development of film appreciation at Bilkent University and create an academic community for all interested persons where they can express their passion for film.